"[The perfect wife] was intensely sympathetic. She was immensely charming. She was utterly unselfish. She excelled in the difficult arts of family life. She sacrificed daily. [...] Above all, she was pure." — Virginia Woolf, "Professions for Women"
What is a Proper Lady? Also known as a "real lady", a "true lady", simply a "lady", or an "angel in the house", she's the perfect lady in the Victorian British mindset. The Proper Lady archetype was widely used in Victorian and earlier literature. Jane Austen was one of the first authors that introduced such qualities to heroines that did not fit into the strictest view of what is acceptable for a Proper Lady, beginning the slow death of this trope. The last time it was seen alive was around the 1950s. Modern ones are likely to be accused of being Purity Sues or have some quirk or flaw that sets them apart from their predecessors. A Proper Lady is a gentle yet strong being, incorruptible and pure as the driven snow, as unlike The Vamp as she comes, and Madonna-like in her virtues. She sacrifices herself for the good of her family, religion, and country. She is intelligent enough to smoothly run a household, and wisely spends her husband's money for the good of her family, never guilty of negligence or selfish frivolity. She possesses the wit, taste and esprit necessary to be a star of Society, and never crosses the border of good taste and civility. She is devoted and loyal, never treacherous or scheming. Her manners are never less than impeccable, and her good will and charity are a beacon to those lucky enough to live around her. She is perfectly groomed, likely beautiful or at least comely (while the female antagonist will be more beautiful and appealing). However, more important than her personal looks is her gentle smile. Because small size is endearing (and allows for protective embraces from her lucky husband or fiancé), she will probably be on the shorter side. Chances are that she has dark hair and fair skin. Parasol of Prettiness is a typical prop. A Proper Lady might not always be able to defend herself, but should in most cases possess the strength of mind to not panic, and the willpower to never give in to any vile demands. She is always upper class and nearly always married, often a mother. She might also be a redundant woman , in which case she will not be bitter about never getting married, and will instead direct her motherly instincts for the good of her sister's or brother's family. Lower class women and maidens can have many qualities of a Proper Lady, and should, per this trope and the ideals behind it, aim to be as like her as possible. There is no upper age limit to being a Proper Lady. Widowed ladies might easily double-qualify as Determined Widows. If a lady dies at an advanced age, her death will be dignified, probably caused by old age, and if she dies young (of nothing too unsightly), it will be a heartbreaking, but not in vain, tragedy. Her absence will leave behind a great void and she will be dearly missed by not only family members and friends, but also by those who only occasionally had the fortune to be graced with her presence. She is expected to show proper ladylike behavior. English Rose: An archetypal English character with similar properties; popular standard for a Proper Lady's looks. Every Proper Lady Should Curtsy: A greeting showing her femininity. Grande Dame: A rare subtype is a mature Proper Lady; even then, she would have been a figure of (good-natured) fun even in Victorian times. Granny Classic: An old Proper Lady. The High Queen: A regal variety. The Ingenue: A potential future Proper Lady. Lady of Adventure: Proper Lady (or more likely Spirited Young Lady) meets Glory Seeker. Lady of War: Proper Lady or Spirited Young Lady meets Action Girl. MadonnaWhore Complex: Virginal before marriage, chaste during and after marriage. If she doesn't live up to this standard, she cannot be considered a Proper Lady. Motherhood Is Superior: Is a doting (but firm) mother, or aspires to be one, and it's considered her "destiny" and/or "natural role" by society at large. Prim and Proper Bun: A hairstyle to indicate a Proper Lady. Silk Hiding Steel: A Proper Lady who is able and willing to take an active role. Spirited Young Lady: A little more spunky; a little less prim. 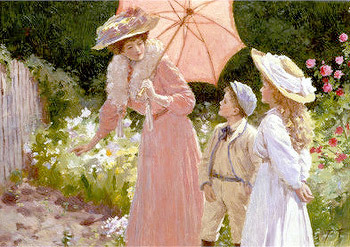 Woman in White: A color showing her purity. The Woman Wearing the Queenly Mask: Proper Lady meets Iron Lady, add self-sacrifice according to taste. Yamato Nadeshiko: The Japanese (or at least East Asian) version. All Women Are Prudes: All true ladies are free from carnal desire. Angelic Beauty: Is often described in these terms. Beauty Equals Goodness: Will always be extraordinarily beautiful (naturally, of course), or at least conventionally-attractive, for the time and place in which she resides. Heroic Self-Deprecation: Always puts others' needs before her own, never expects anything in return, or thinks of herself as special for doing it. Hysterical Woman: A lady usually has enough dignity to avert this, although she is usually emotional. Lie Back and Think of England: Originally the only proper way to deal with the wifely duties while not compromising the purity of a lady. The Lost Lenore: If her husband outlives her, she will most likely be this to him. The Teetotaler: Drinking is unladylike, therefore she doesn't. Too Good for This Sinful Earth: If and when she dies, this is probably invoked. Victorian Novel Disease: This is the way she will die, if she does not simply die of old age or as a result of childbirth. Women Are Delicate: Super Trope to Proper Lady. 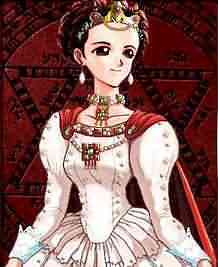 Axis Powers Hetalia has Liechtenstein, a Yamato Nadeshiko who comes from West/Central Europe rather than East Asia. She's humble, kind, quiet, deferring yet not completely submissive to her brother Switzerland, very mature for a young nation, and quite competent at housework. Vivi, Sandra, Nadia, Liliya, and Valentine from A Cruel God Reigns, and oddly enough all of them also fall under the Broken Bird trope, to varying degrees. Each girl is portrayed as sweet, loving, pure, gentle, and fragile. It presents the mild mannered Mirajane, who is not only the most feminine member of Fairy Tail but adorable and capable of cooking. She runs the guild from behind the scenes and her rank as a mage is Class S.
Edo-Cana is even more feminine and soft than Mirajane. 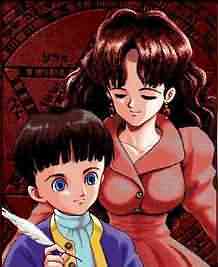 Ed and Al Elric's Missing Mom Trisha. In all the flashbacks she is sweet and loving to her kids and willing to wait forever for her husband. The shoujo manga Lady by Yoko Hanabusa takes the concept and makes it central to the plot. The main character, Lynn Russell (also known as Rin Midorikawa), is a half-Japanese and half-English girl from The Roaring '20s; after her Japanese mother Misuzu dies in an accident while protecting her, little Lynn decides to honor her via becoming this. Her paternal half-sister, Sarah Russell, is on her way to become one as well. She got this from her Missing Mom, Frances. As the title may indicate, Lady Jewelpet takes place in an institute that teaches girls how to be this trope. Results vary. A few girls in Revolutionary Girl Utena. The series plays around with this trope a lot. Utena's not one, but once tries to act like one after Touga defeats her and she temporarily loses Anthy... yet not only it's very forced, but she's only using a part of the whole concept (being passive and ladylike, but not applying the Silk Hiding Steel). Emma starts as a poor peasant girl, becomes a flower girl, a maid, and ends up becoming a gentleman's sweetheart. While her background technically prevents her from becoming a true lady in the society's eyes, her angel-like disposition, good education, eventual marriage (although with Nouveau Riche) and careful grooming should make her one in all but name. William's mother Aurelia is a weird case. She has the status and loveable nature of a Proper Lady, but also lacks the social and entertaining skills she would have needed to appeal to the London society. Despite everything, she is content to attend social life with her husband to make him appear the best he could even while she silently hates the whole thing. A wearying life filled with social obligations, combined with the strain of having children, made Aurelia physically ill. She is saved from the standard tragic death, but has to leave London and basically abandon her family in order to save their face. 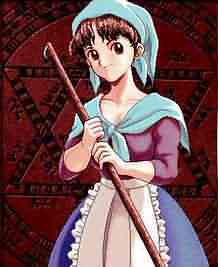 Windaria has Alan's House Wife Marie, a grand example of an honest and wholesome young lady. She also helps him sell their vegetables at market. Obscure 1950s superheroine Tomboy's Secret Identity was "perfect little lady" Janie Jackson. In The Fledgling Year, Action Girl/One of the Boys Aravis invokes this trope when she slips into her persona as a Tarkheena. This provokes very entertaining reactions from everyone who didnt expect her to be capable of such suave formality and politesse. Moana Dixon in The Miraculous Adventure Of Tessa And Lunala and The Lilo Adventures fits the trope. She is known for her courage and kindness, but she does have a flamboyant side to her. Another main character, Brianna, also fits the trope pretty well. Like Moana, she has a kind personality and proper manners. She does get angry on some occasions, and she freaks out several times, first shown when Ash, Serena, Blake and Jasmine learn her father's identity. Victoria from Corpse Bride is a rare clean-cut modern example without parody or deconstruction. With the Perfectly Arranged Marriage, you just know how devoted a wife she will be for lucky, lucky Victor. She seems nothing but a sweet young girl, determined to help him when he's troubled. Emily the Corpse Bride is her more enthusiastic counterpart. Sally from The Nightmare Before Christmas fits this trope pretty well. She has the modest, feminine personality and attire, and is domestic and sensible. She's a leaf-filled patchwork doll with stitches all over her body and puts deadly nightshade in her creator's food and drink to get out of the house, which gives her shades of being more determined and shows she has a great desire to be free. Snow White and the Seven Dwarfs: Snow White, the first and fairest of them, all stands out as her feminine traits like domesticity and sweetness are emphasized, and thus she is the quintessential example in Disney canon. Cinderella: The title character is gentle, submissive, and even when her stepmother forces her to become a servant in her own house, remains stoic and gracious. Sleeping Beauty: Aurora is elegant, quiet (with the fewest lines of any Disney Princess), dutiful and obedient, including following her fairy godmother's command that she can't marry the man she loves and must return to her life as a princess. Duchess is a regal, wealthy cat of refinement and good manners, but takes her adventures well and stays level-headed. Her daughter, Marie, tries hard to be one, but with her proud attitude, it doesn't always work. Their sophisticated widowed owner, Madame Bonfamille, is very proper as well. Queen Elinor from Brave is refined, feminine and stops brawls through quiet dignity and a few careful words rather than with confrontation. A big part of the plot is fueled by her attempts to turn her daughter, Merida, into this. Elinor: A lady enjoys elegant pursuits/rises early/does not stuff her gob/does not place her weapons on the table. After learning to control her powers, Elsa from Frozen is collected and poised enough to eventually be The High Queen. In A Sister More Like Me, she enjoys a quiet tea, keeping things clean and neat, and intellectual pursuits such as geometry. Maria's father wants her to become this, hence sending her to study abroad at a Spanish convent, so she would stop causing trouble in San Angel. Luckily for San Angel, it didn't work, and she comes back a full-fledged badass. La Muerte is poised, elegant, kind, and thoughtful. Deconstructed in Hysteria. Emily Dalrymple channels this Victorian ideal of a properly feminine woman. She is a rather capable mistress of her widowed father's household, and agrees to marry her father's young assistant so that his successful medical clinic could stay in the family even though she loves him more like a friend or a brother. Later she admits that she behaved like her father had expected her to behave, and she wants to be more true to herself and behave more freely. The lady addressed/discussed in Coventry Patmore's 1854 poem The Angel in the House. This work named the ideal for the Victorian era. Melanie Wilkes. She's gentle, prim, selfless, and when push comes to shove she shows she has will and guts to protect those near and dear to her. Even the feisty Scarlett who originally disliked her comes to love and miss her. Rhett Butler claims to respect Melanie deeply. Scarlett's dead mother is an invoked example. She's a never-attainable ideal for Scarlett who knows her temperament and pride will never allow her to become like her mother. From how the family and especially her husband Gerald function (they don't, really) when she's gone it's quite clear she was the pillar of the household. Even some of the slaves say they miss her dearly. Hortense in Small Island thinks this is how all British women of any class act, but takes it to such an extent that British people think she's weird. Esther Summerson, from Charles Dickens' Bleak House, is a Victorian English specimen. She's kind, modest, sensible, and domestically competent, but too down-to-earth to be a Purity Sue. 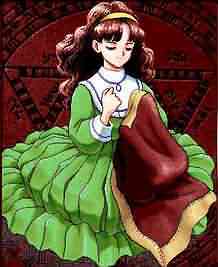 Esther is also a deconstruction of the trope, as her extreme humility seems to be in part the result of an upbringing that would be considered emotionally abusive by most modern standards. She could also be interpreted as just pretending to be one as a cover for her own management skills: she takes control over situations or exerts authority over people while presenting herself as modest, unassuming, etc. Amy Dorrit, from another Dickens novel, Little Dorrit, seems to be a reconstruction, since her father is a former gentleman in debtor's prison who insists on his children's "gentility" while mooching and sponging off all and sundry. Despite her father's twisting of the ideal, Amy upholds true nobility of soul, and ends the novel a figure of quiet purity and strength. Katy in the What Katy Did novels by Susan Coolidge is a Tom Boy who learns to be a Proper Lady. The one who taught her to be this is her cousin Helen; she mixes this, Cool Big Sis... and Ill Girl. Sir Thomas: I had thought you peculiarly free from wilfulness of temper, self-conceit, and every tendency to that independence of spirit which prevails so much in modern days, even in young women, and which in young women is offensive and disgusting beyond all common offence. But you have now shewn me that you can be wilful and perverse; that you can and will decide for yourself, without any consideration or deference for those who have surely some right to guide you, without even asking their advice. You have shewn yourself very, very different from anything that I had imagined. In the Austenverse, Pride and Prejudice's Jane Bennet. She stubbornly believes the best of everyone, everyone loves her for her sweetness, and she's the only one with enough patience to put up with her perpetually querulous mother. But, like Fanny, in addition to being beautiful and kind, she's also intelligent, rational, and sensible. Emmas's older sister Isabella (Mrs John Knightley) is a sweet, beautiful and elegant woman, an affectionate mother, wife, sister and daughter, and a perfect hostess. She quite fulfills the role of "angel of the house" as she never disagrees with her husband. Her brother-in-law Mr Knightley admits that compared to Emma, Isabella's not that interesting and knows that Emma is far more intelligent. Jane Fairfax is of the same age as Emma and comes from the same neighbourhood and a suitable family. Everybody expects that they should be friends, but Jane is almost too proper if you ask Emma. She's beautiful, intelligent, accomplished and gentle, and seems to be admired by everybody. Emma thinks she should be friendlier and livelier, and Mr Knightly owns that Jane doesn't have an open temper. Margaret aka Meg, Beth's eldest sister who plays Team Mom and Proper Lady to her three little sisters (shy Beth, Spirited Young Lady Jo, and Spoiled Brat Amy) and her friends (the Spoiled Sweet, but borderline Brainless Beauties Annie and Belle). Elizabeth "Beth" March evolves from a Fragile Flower into Proper Lady in the second part of the book, before dying. May have taken after her mother, Margaret aka Marmee. The girls' mother is a Proper Lady after having been more Hot-Blooded in her youth. Her wisdom and strong will are emphasized more than humility and kindness. Lady Catelyn "Cat" Tully-Stark. She is calm and a source of wisdom and advice to others, while maintaining her role in society. The Tully motto is "Family, Duty, Honor," and those are the words she lives by. Catelyn's daughter Sansa is a lord's daughter and very often channels Princess Classic. She is very good at all things proper for a Westerosi noble girl at her age, and is a sweet girl. This is part of the reason for conflict with her tomboyish sister Arya. Maria Clara de los Santos, the female lead and Love Interest in Filipino national hero Jose Rizal's novel Noli Me Tangere, is promoted as such. Being religious, the epitome of virtue, demure and self-effacing and endowed with beauty, grace, and charm, she was promoted by Rizal as the ideal image of a Filipino woman who deserves to be placed on the pedestal of male honor (and she apparently was an expy or Rizal's real life love, Leonor Rivera). Modern readers and authors, however, have noted the Values Dissonance since poor Maria Clara also was "chaste, masochistic and easily fainting", calling her the "greatest misfortune that has befallen the Filipina in the last one hundred years". In Death: Played with. Dr. Mira seems to give this off like pheremones. However, it was revealed early on that she had been raped by her stepfather, and she turns out to have flaws. Clarissa Price is a social worker in the story Purity In Death, who is lady-like and beautiful, which seems odd, considering that she works in a job that usually puts lines on someone's face. However, it turns out that she has failed to dot her i's and cross her t's, as well as being a party to murder, but she certainly suffered a Villainous Breakdown when Eve showed pictures of a teenaged girl who was essentially murdered by the terrorists Price was working for. Avril from Origin In Death starts off like this. However, she ends up murdering her own husband and helps in murdering people connected to him. Why? Because she is a clone created by her husband and his father, and while she would have lived with that, she found out that her husband had broken his promise to not clone their children (he was treating them as things to be replaced rather than human beings), and so she decided to go Mama Bear on him and his little science project. Hopscotch: Gekrepten, Oliveira's wife/girlfriend/whatever back in Argentina. She immediately accepts him after running away to Paris and never complains the fact that he stays all day at her place, never working. Heck, she even takes care of him after the trap incident. Subverted in that, no matter what she does, Horacio will never respect, care or love her because she isn't as intelligent/interesting as La Maga or Talita. Elizabeth Pennykettle from The Last Dragon Chronicles is a perfect example of this trope. She's also the resident Team Mom and Incorruptible Pure Pureness. Plus, she's a good cook. One Hundred Years of Solitude: The matriarch of the family, Úrsula Iguaran, is a subversion. She is very devoted to her family, but also extremely stubborn and more than capable of standing up to her husband/children/descendants, even if she has to hit them (as she did to Arcadio) or mouth them off roughly (to both José Arcadio Buendia or Colonel Aureliano). Comes up in A Brother's Price, a Romance Novel with inverted gender roles. As a noble and a cousin to the royal princesses, Cullen Moorland is expected to be one of these, and he plays the part well, but he finds the expectations for being a proper young man to be boring and stifling, and he desperately envies Jerin. Adele Ratignolle from Kate Chopin's novel The Awakening. Her submissiveness and devotion to her family and husband make her a foil to The Protagonist Edna. Adele is extremely sweet, feminine, and fragile. However, Adele Ratignolle's open-minded Creole ways help Edna to unleash her inner self and the artist in her. Sidonie "Sido" De Ville Duval from The Red Necklace. Sido is a shy, compassionate girl who is very loyal to her father even though he ignores and mistreats her constantly. Her sweet nature wins over most anyone. Simona Ahrnstedt has two examples of this. Sofia Löwenström in Överenskommelser is beautiful and demure and flawless, thus basically perfect according to the standards of the 1880s. Venus Dag och Natt in "De skandalösa" is a 17th century version of this, and she's beautiful, demure and near-flawless. Subverted, as she turns out to be gay, which would have been a negative trait and move her far from the ideal of femininity in her era. Lissa Dragomir from Vampire Academy is gentle, strong-willed, a Socialite, is loyal to the people she cares about, has proper manners, is kind-hearted and beautiful, and is naturally upper-class. The Stormlight Archive: Women of the Vorin religion are expected to be controlled, quiet, and scholarly. The vast majority of Vorin scholars are women, with the only men being ardents (who are legally genderless). The traditional Vorin dress is the havah, which is form-fitting like a Chinese Dress but without any skin showing. One of the oddities of Vorinism is that women are supposed to keep their left hands hidden at all times in a sleeve. This "safehand" is not supposed to be used for anything, so the more higher-class women become very good at only using their right hands. Peasant women just wear a glove. Lady Marjorie is adored by her husband and servants, and a Proper Lady through and through. Her saintlikeness is tarnished only by a short affair she was quick to regret. Also gets a tragic death. Of course, after she dies, everything starts to slowly fall to pieces. Hazel Bellamy is a steel core lady, very refined and composed, although not of genteel pedigree. A rare example of a Proper Lady who has ever actually done working class work. On Our Miss Brooks, Mrs. Conklin fulfills this role. She's the kindly, intelligent and dignified wife of Miss Brooks' Mr. Conklin. In the Supernatural episode "What Is And What Should Never Be", Mary from 'wishverse' is portrayed as incredibly gentle and devoted, appearing as a Madonna-like character. Tom Jones' "She's a Lady" seems to describe this sort of woman. She's got style, she's got grace, always something nice to say and so on. The Ancient Greek concept of arete (virtue/excellence) as applied to women matches all the values of the Proper Lady, making this Older Than Feudalism. Odysseus' wife Penelope from the ancient epic The Odyssey was presented as the Ur-Example. Domestic and beautiful, she has stayed faithful to Odysseus, waiting for him for twenty years. Goddess Hera/Juno is the Greek patron deity of women and marriage; however, considering her behavior whenever Zeus cheats on her (and man, does he cheat on her), she comes off as a Yandere instead. Hera/Juno's sister Hestia/Vesta , virgin goddess of households and families, seems to be more of the real deal. Queen Alcestis, the only one brave and loving enough to offer her own life in exchange for her husband Admetus'. Luckily for her, Admetus happened to have an old friend named Heracles, who offered to bring her back from the Underworld... and did so by wrestling The Grim Reaper. The Virgin Mary is presented as the epitome of this trope, she being the perfect mother figure (indeed, the mother of Jesus Himself and spiritual mother to all His followers) and all. She's presented as beautiful and graceful, humble, chaste, wise, and altruistic. She is held up as the perfect woman, and many Christian girls (especially Catholic ones) as well as Muslim girls, are encouraged to be more like her. Many female Catholic saints also qualify, although many others are subversions. Notably, along with Virgin Mary, they were an important part of forming this ideal. 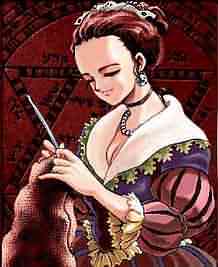 Female protagonists tend to follow the ladylike ideals if they are peasant girls. Princesses might need to go through a humbling procedure before they can be Princess Classic. Ivory claimed to be a lady in contrast to sluts and skanks like Barbara Bush and Tori on Monday Night Raw. And that was tame compared to when she joined Right To Censor. Made In Sin imagine themselves to be proper ladies. Coworker opinion might vary but what do they know? "Pinkies up!" Pygmalion and the later version My Fair Lady are about attempting to groom a poor girl into a lady. It works rather well — except that the girl also gains enough dignity and self-respect that she walks out. In the play Pygmalion, she never comes back. Princess Sarah of Final Fantasy I was the first in a long line of beautiful, noble princesses. She always wears gold dresses and even has Hair of Gold, Heart of Gold. 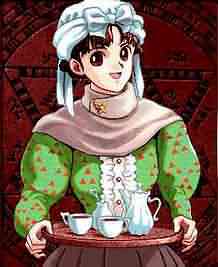 Final Fantasy IX gives us Princess Garnet Til Alexandros, AKA Dagger, who's a demure little princess when she's not being a rebellious one. 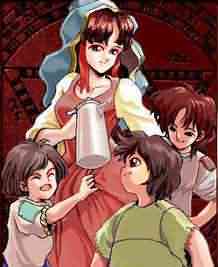 Some of the Multiple Endings in the Princess Maker franchise, if your daughter's skills fall on the domestic side (high conversation, temperance, cooking and cleaning). Specially obvious in the "homemaker ◊" ending, but also invoked in the "tutor ◊", "babysitter ◊", "millionaire's wife" ◊, "merchant's wife ◊", "maid ◊" and "Queen Consort ◊" ones. The Queen of the land in PM 2 is an older version of the trope. In fact, to meet her you must have very high temperance, which is obtained only through housework. Subverted with Akatsuki in Kantai Collection. Her insistence in being treated as a proper lady has the opposite effect of making her looking childish instead. In No Rest for the Wicked, Perrault disbelieves November because such a refined young lady could hardly come through The Lost Woods untouched. Around the World in 80 Days: Belinda Maze is not only a victorian lady, she's also devoted to her beloved Phileas Fogg and certainly nicer than her rotten uncle Lord Maze. My Little Pony: Friendship Is Magic: Rarity believes herself to be this, and certainly acts the part in high society. It's the things she does around her friends and threats to them that prevent her from really living up to this ideal. Phineas and Ferb: The episode "My Fair Goalie" has Candace demands to her english cousin Eliza to train her in the basics of being a proper lady, to which the Englishwoman reluctantly approves. She reverts back to being her usual self at the end. The Pixie Tune in Winx Club. She holds the image of a 'perfect lady' in the way she talks and acts proper just like a lady should. Ironically, she is the bonded pixie of Musa, the Tomboy member of the Winx. Princess Elisabeth of Hesse and by Rhine , the beautiful and pious sister-in-law to Czar Nicholas II. When her husband Sergei was brutally assassinated, she didn't hold a grudge against his killers, and pardoned them publicly before becoming a nun and selling all of her jewelry to use the money for charity. An agency in London gave lessons on how to be a Proper Lady called the "Princess Prep" workshop. Princess Alice, the third of Queen Victoria and Prince Albert's nine children, was beloved by her family for her selfless and considerate nature. When Albert died of typhoid fever, Victoria was thrown into deep mourning from which she never completely recovered, and it was Alice who took over many of the details of the royal household; one of Victoria's courtiers even referred to the princess in writings as "the angel in the house." Lady Diana Spencer, still known as "Princess Diana" by people who like her (which is a lot), was a zig-zagged example. She was accepted as a member of the British Royal Family because of her proper behavior and manners, but after her marriage to Prince Charles, she showed some harmless rebellious streaks such as disobeying some of the Royal fashion rules. However, in the end, she did remain a proper lady and a great mother.